Designed to cool 650+ HP OR Customize up to 950 HP. 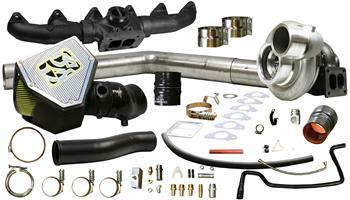 Exclusive BD T4 Wastegate ready, race manifold. Keeps your bottom end power strong with pulse technology, while still providing a Wastegate option for protecting your charger with higher HP use and or NOS usage if needed. BD custom intake and air box. Keeps your intake temperatures low and HP high. Avoid HP robbing heat soak and elevated intake temperatures from your engine bay. Exclusive BD Velocity Stack 8” OD Air Filter out performs the competition. Efficient and exclusive large single piece 90 Degree outlet turbocharger gives higher CFM with lower losses compared to equivalent multi piece compressor covers. Kit comes with all supporting fasteners and hardware for a seamless install. Note: S467 low A/R combinations must be wastegated to prevent turbocharger over speed conditions.